Forum Home > BIRKIN'S LABORATORY > Christine Henri in RE3? Good day my fellow researchers, I am back and I present here my findings on Christine Henri derived from Resident Evil 3 Nemesis The Mercenaries Operation Mad Jackal and the comic book adaptation of it: Bio Hazard 3 Last Escape HK comics. Attention! This topic is a retrospective and is not meant to be indicative of recent events and as such even if the premis of my topic is true it is very likely to be obsolete. Have we already seen Christine Henri and did not know it? As we all know In RE2 there is a file called "Operations Instructions" that shows that Christine Henri is the R&D facility head manager of the French division and it was her who directly ordered Special Agent HUNK and his Alpha team to retrieve the G-Virus from William Birkin. Resident Evil 3 Nemesis has an epilogue of HUNK and while it does not mention Christine Henri it does indeed show that the team behind RE3 at least knew of the events behind RE2 that involved HUNK and the recovery of the G-Virus. 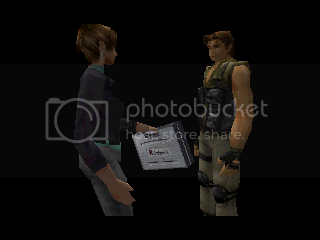 In Resident Evil ARCHIVES, the HUNK profile mentions HUNK is directly under the control of Christine who is a executive of the French branch. 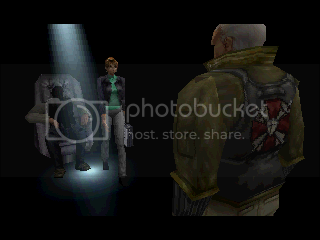 Resident Evil 3 Nemesis has a fun mini-game called "The Mercenaries Operation Mad Jackal" where a player character either Carlos, Victor or Nicolai must reach a specified location where they receive money and their freedom from a female with a briefcase, next to her is a man sitting in a chair, the man re-uses the model of Brian Irons but the female has her own unique model. The scene is expanded with the female & male from The Mercenaries having expanded roles. The male appears to be a higher up within Umbrella Incorporated called "Boss" but what is really interesting is special agent HUNK makes an appearance and reports to the female and "Boss". Specifically in the comic the unnamed female and Boss are at Umbrella European HQ but then decided to take a helicopter to Raccoon City, get debriefed from HUNK and then use Carlos in a little "mini-game" to further their own agenda. Since we and CAPCOM both knew that HUNK reported to Christine Henri who is at Europe then does that mean that this unnamed female that HUNK reports to could be Christine Henri herself? Who in turn reports to this "Boss" fellow? - But Operation Mad Jackal does not actually take place or does it? Resident Evil 3 was made after Resident Evil 2 which means the most recent mini-game was "The 4th Survivor" which stars Special Agent HUNK an did indeed actually take place.
" I heard the boss who gives money in The Mercenaries is someone involved with Umbrella, but please tell us about him in detail. Kawamura: Let's reveal the truth behind the The Mercenaries scene. As a matter of fact, The Mercenaries is a popular entertainment program of the underworld that only very few aristocrats, high-ranking government officials and the super-wealthy can watch in a secret members-only Pay-Per-View (paid program broadcast) televised by Umbrella. The mystery man giving the mercenaries instructions and rewards is the host and producer of the program. The condition of the mercenaries is broadcast live by satellite with high-performance microphones attached to the mercenaries, installed by the Monitors. The time displayed on-screen is a time display broadcast to the mercenaries and the audience's approval rating (viewership) is added to it in real time. If the mercenary fights heroically, extravagantly defeats enemies and impressively rescues civilians and comrades, airtime will be extended if they gracefully escape from the crisis. If they garner support well and reach the goal within the airtime, they're given a reward depending on the audience rating and the mercenary will be freed. Mercenaries who can't earn the audience's approval rating have their camera cut off upon timeout and lose their life at the same time. " I do not see a cause for this to not be true seeing as how it is the official site for the Japanese version of Bio hazard 3 Last Escape so I think it is very safe to say that The Mercenaries actually did happen in the Bio Hazard/Resident Evil timeline. 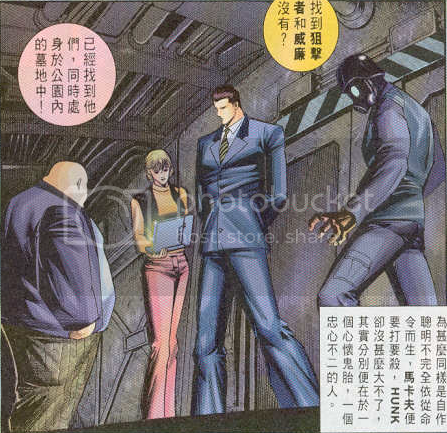 To me the events surrounding The Mercenaries in Bio3 HK comics at least shows that the team behind the Bio3 HK comics was at last aware of the truth behind The Mercenaries scene not unlike how the wild storm comic book team where giving behind the scenes information. Lastly back when Bio3 was still early in development it was desired for it to have a closer connection with Bio2 and learn more about William Birkin and his feud with Umbrella. "Q. Is there a reason why Dr. Birkin gave up his ambitions to became an executive officer after the final entry of the BIOHAZARD 2 file, "Mail to the Chief"? A. I created BIO3's circumstances to explain the files of BIO2. In my interpretation, I thought Birkin didn't regard the G-Virus as raw material for creating biological weapons. The biggest difference between the T-Virus and G-Virus is whether it's a virus which produces mutations, or a virus of God for producing a new species. About the question whether he wanted to become an executive, you could say it's correct, even if it differs. Why was he an executive candidate? He wanted Umbrella's power. Don't doctors want patrons to support their research with full support? There's a difference between Birkin and Wesker. Wesker wanted immense power for his own sake. Wesker was also a researcher, but I think he was a prisoner of power. Thus, unlike Birkin, he took off the white robes. Birkin would've wanted to have abundant research funds through holding Umbrella's power. He probably didn't necessarily want to become a billionaire or politician, and wanted to be an executive. What's the difference? However, in my opinion, I think Umbrella's demands were always different from Birkin's wishes. It's the same with us designers, the thoughts of managers are different. " Since the game was to explore more of Bio2 then it is not outrageous to think it would have expanded more on HUNK as well especially as in the final product he ended up having his own epilogue. Perhaps Christine Henri herself was to have made a psychical appearance in the beta Bio3 with her own model even being made but when the game got shortened her main role was cut out but she ended up being used in a small role in The Mercenaries Operation Mad Jackal. Could this female be the legendary Christine Henri? Thank you everyone who read my post. The nobility will rise again. Until that time, farewell! Posts: 442 Reading through all of that, regardless if it's true or not, I can't believe I've never noticed the parallel between The Mercenaries characters and that comic. It's a really great observation, good job! Interesting reading Yuan, I have always been intrigued by these minor characters with positions, actions, and backstories that make ripples of interest far greater than some of the more prominent figures (looking at you Kennedy), such as Dario Rosso, Juan Raval, the Mayor's daughter, and of course the mysterious female character shown at the end of Merceneries. Word of caution with your smart, sharp refrence of that representation of the 'Merceneries Female' in the Chinese comics; they can throw up some terribly ridiculous and laughably outlandish narratives, including proposterous super-powers. But in this instance with your research you've cleary indentified a direct parrallel in the narrative between game & comic that works well. I was also interested to check if Henri or a character who could reasonably be considered to represent her, appears in the Biohazard Drama Album 'The Female Spy Ada Lives' (Project Umbrella translation), but alas I could not find one with my eye. Maybe those with more knowledge of the Resident Evil 3 development team's work would have something on Christine Henri, such as Welsh. Can anyone get a translation of those Japanese speech bubbles? They might throw up more information on her. That woman we see at he end of Merceneries always intrigued me, Yuan's insighful eye that she's afforded her own character model was a main reason for driving my interest further than ending it with the assumption she couldnt be much more than a mini-game extra. 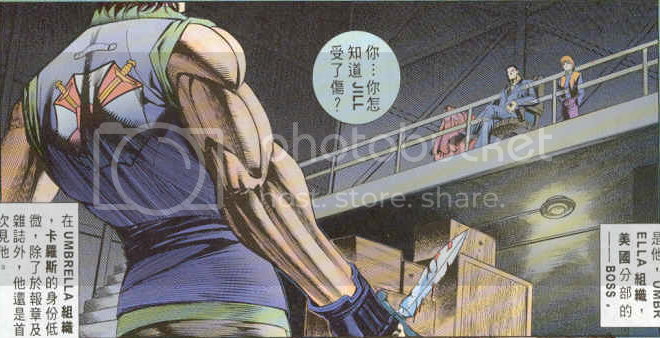 Cant believe you found the very same Umbrella female employee in the RE3 comic, that's great research right there. I really do hope someone can go thru her speech bubbles and translate them. I would like to extend my welcomes to all who participated in this topic of mine... I suffered a personal loss a few months back that pushed me further back into seclusion and was hoping for this topic to be my comeback to the forums... mission successful! Facility Director/Institute Director is indeed more accurate while fitting the narrative of the Umbrella French Subsidiary better as France does not use the title "manager" instead using the title "director" so Christine Henri using R&D Facility Head Manager was always a inaccurate English mistake. 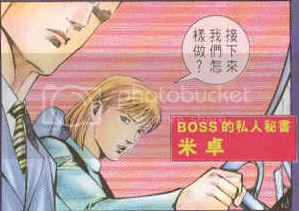 The Umbrella female employee from the HK Comics directly speaks no less then 4 separate times with her own special colored speech bubbles in affliction to the fact that the 1 scene focusing on her gives a special colored background which to me further highlights her importance... I would go as far as saying she is the 2nd most important female character in the entire HK comic 2nd only behind Jill Valentine herself as although Claire Redfield, Sherry Birkin, Annette & Ada Wong appear their appearances are mostly cameos. Here are the four panels I was talking about the Umbrella female employee gets her own speech bubbles. Yuan-The-11th more RE fans should be investigating the origin story of Christine Henri because she plays a high ranking role in Umbrella and was integral in the procurement of the G-virus. Characters of lesser importance get far more forum time and it's very interesting to me reading posts like yours that focus on the real issues like individuals who played significant roles in Umbrella's conspiracy and not the 'cool popoular' ones. Now please can someone try and get these speech bubbles translated. Put a request in The Spencer Mansion for Yuki the site translator to take a look at it. Great thread this may finally shed some more light on this important Umbrella figurehead we hear & know little about. Thanks for posting but without any additional sources for Christine Henri that I could find I have nothing further to add unless a translation can unearth a lead. I will have my revenge on Umbrella! Posts: 442 Just to note, those are Chinese not Japanese. Which I believe is why only one issue out of the hundreds ever got translated. Just to note, those are Chinese not Japanese. Which I believe is why only one issue out of the hundreds ever got translated. Yes unfortunately this may be the issue for a lack of good translations of the Hong Kong issues. Now whilst I'm of the opinion it would be a waste of resources to translate the Biohazard Zero & Biohazard 2 run of issues, due to their horrendoulsy ridiculous additional plot points & variations on the original video game narrative (including super powers so far-fetched in the extreme), I have been reliably informed by both Yuan-The-11th & William Birkin that the Chinese, Hong Kong published run of Biohazard 3 comics match the other Hong Kong publihsed set of Code:Veronica comics, in their integrity & quality of keeping close to the original video game narrative, free of added stupidity.